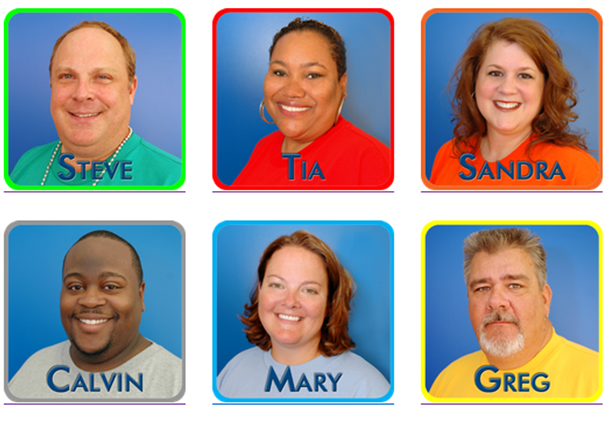 The Biggest Loser: Detroit Edition III contestants, from left: Ryan Turner, Greg Trzaskoma, James Preacher, Amanda Barker, Helen Atwell and Jeanine Wilson. You voted and we listened. With over 30,000 votes, the final six contestants have been selected for the next round of Biggest Loser: Detroit Edition III. The 11-week competition is sponsored by Blue Cross Blue Shield of Michigan, WDIV-TV and The Parade Company. The competition kicked off Aug. 29 with a celebration at The Parade Company. Guests enjoyed fitness demonstrations, an array of healthy Hawaiian-themed food and the opportunity to meet the final six contestants. I love what I do because I get to teach others about topics from healthy eating to exercise as a dietitian for Blue Cross Blue Shield of Michigan’s Wellness and Care Management Consulting team, but I also get to learn from the very smart people around me as well. I thought it might be interesting to share some of the ways I get to help promote wellness with my fellow BCBSM employees, individuals and communities across the state. I feel so blessed to have participated as a health coach for the Biggest Loser: Detroit Edition II in 2010. I had the honor of coaching the eventual winner of the competition, Steve Anderson on his way to victory. He lost 56 pounds during the 12 week competition. This was an experience that changed his life for the better. In the end, not only did I help Steve, but I also learned so much. BCBSM promotes wellness for its employees and provides the tools needed for everyone to adopt healthier lifestyles. These topics are key in building a culture of wellness at the workplace. Does your employer advocate a culture of wellness at work? I’d love for you to share how your workplace supports healthy living. As a health coach, dietitian and a certified diabetes educator, I was excited to participate in BCBSM’s Wellness Week as a presenter, but also as an employee. One of the most important steps of changing behaviors is taking time to learn, and then taking it a step further by acting on what is learned. 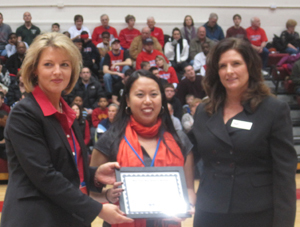 On January 16 2011, BCBSM employees were “Celebrating Wellness” at the University of Detroit Mercy versus Valparaiso game. This game was the kick-off to Healthy Weight Week. At this game, I was an honorary guest coach with Tricia Keith, the vice president of Corporate Secretary and Services. Sitting courtside was a blast. I love sports and the passion shown by the players. I received an award for the work I did with Steve Anderson, Detroit’s Biggest Loser and for helping Blue Cross lead Michigan to a healthier future. Blue Cross Blue Shield of Michigan continues to advocate for a healthier you in the workplace, in the community and at home in your personal life. Let’s continue to work together to truly build a healthier Michigan. Please feel free to contact me at any time if you have any questions. I would love to hear from you! Grace Derocha is a registered dietitian and certified diabetes and weight-loss management educator at Blue Cross Blue Shield of Michigan. She is also a featured blogger on A Healthier Michigan where she shares her tips for living a healthier life. Continue reading about Grace on A Healthier Michigan. Halloween is full of tricks and treats – which can be really scary when you’re trying to lose weight. But the Biggest Loser: Detroit Edition II contestants are prepared. With the help of their BCBSM health coaches, they have learned that you can still get into the spirit of Halloween and stay healthy. Last week Calvin, Mary Beth and Sandy met with BCBSM health coaches Andrea Abatemarco and Tara Albosta to put together a variety of delicious but healthy dishes including an autumn stew and brownie pumpkin muffins. Make sure you check out WDIV’s Halloween special that will air tonight at 8:30 p.m. to see the full story. To follow the progress of all of the Biggest Loser: Detroit Edition II contestants check out their blogs on biggestloserdetroit.com. 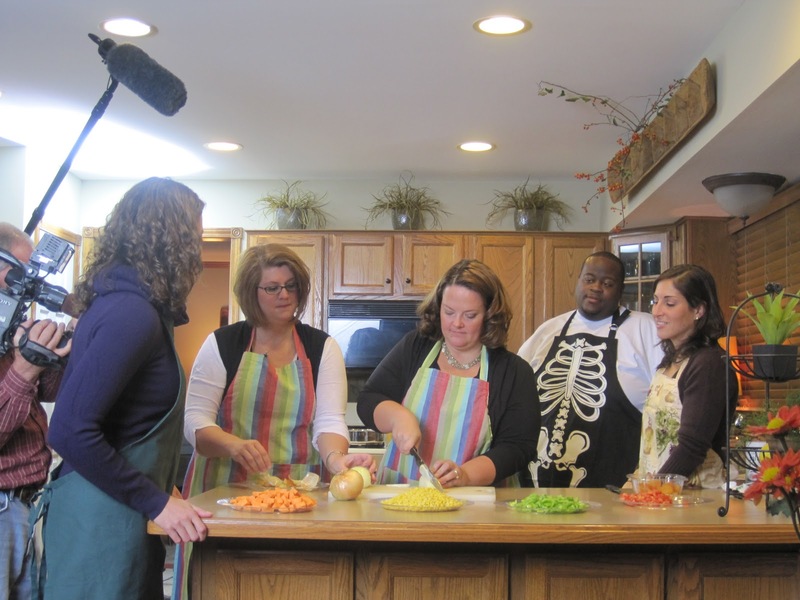 BCBSM health coaches Tara Albosta and Andera Abatemarco show the contestants how to cook a healthy Halloween treat. 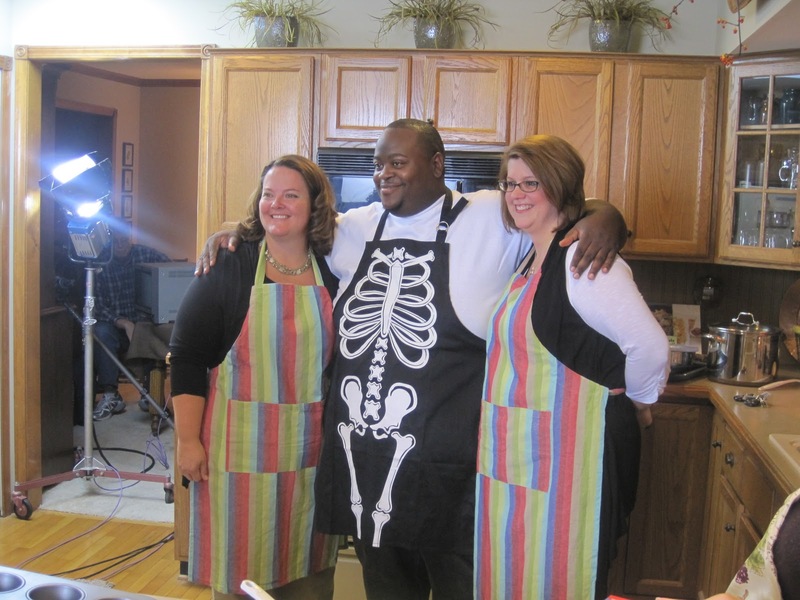 From left to right: Biggest Loser: Detroit Edition II contestants Mary Beth Klawender, Calvin Poellnitz and Sandy Ray pose for the cameras. It’s week 7 of Biggest Loser: Detroit Edition II and the contestants are starting to see results, but they are also feeling the psychological effects of the competition. Last year’s winner, Marilyn Kluka, knows all too well about the emotional rollercoaster they’re on right now. Biggest Loser: Detroit Edition 2009 winner, Marilyn Kluka, talks about her weight-loss journey with WDIV reporter Shawn Ley. Yesterday, Marilyn met with the contestants to talk about the triumphs and struggles of her weight-loss journey on WDIV’s 5 p.m. news broadcast. She talked about finding a balance between eating healthy but occasionally enjoying her favorite (but not so healthy) foods. “Last weekend I had a wedding to go to. I knew I was going to have a glass of wine and a piece of cake. But I also knew that the next day I was going to head to the gym,” she said. 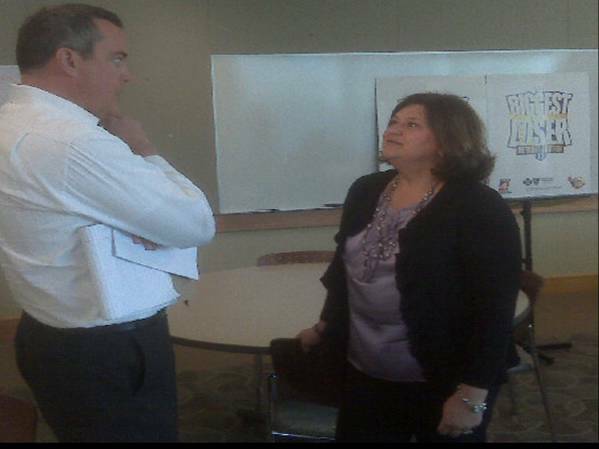 Michelle Fullerton, Blue Cross director of Wellness and Care Management, is interviewed by WDIV reporter Shawn Ley. Marilyn emphasized the importance of staying on track and using the tools and advice provided to them by their Blue Cross health coaches. She also encouraged the contestants to keep in touch with their coach – and each other – after the competition ends. “This is more than an 11-week weight-loss contest, it’s a lifestyle change,” she said. Losing weight is more than a physical challenge, it’s a psychological battle that can take a demanding toll on the mind and spirit. Staying motivated can be one of the most difficult aspects of losing weight. Biggest Loser: Detroit Edition II contestants know the psychological battle with weight loss all too well. For the past seven weeks each has worked hard to stay motivated, but the journey has not always been easy. 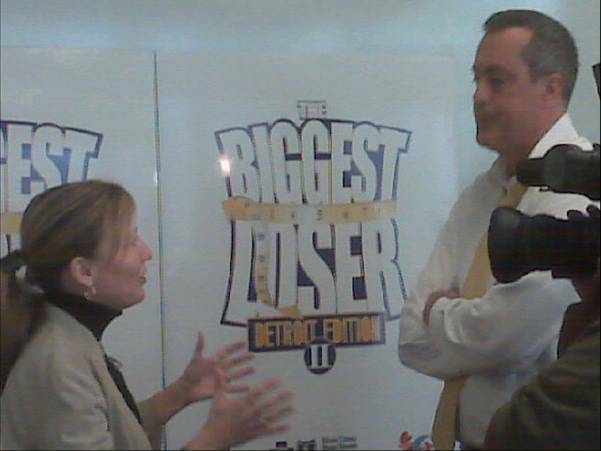 The Biggest Loser: Detroit Edition II is a local version of NBC’s nationally-televised Biggest Loser. Blue Cross Blue Shield of Michigan health coaches provide counseling to each contestant as part of our mission to promote a healthier Michigan. The competition is in its second year of motivating local residents to lose weight and achieve a healthier lifestyle. 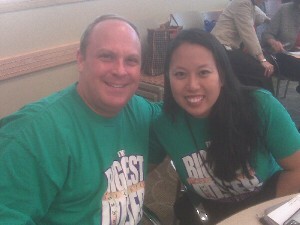 You can follow the inspiring stories of each contestant on their blogs found here: http://www.biggestloserdetroit.com. Help them stay motivated by commenting on the site and sharing links with your friends. You can also see how they continue to support one another as they comment on each others’ posts. Tune in to WDIV (Local 4) to learn how Blue Cross Blue Shield of Michigan health coaches provide emotional support to the contestants, and see how last year’s Biggest Loser: Detroit Edition winner, Marilyn Kluka continues her commitment to a healthy lifestyle almost one year later. Marilyn lost more than 70 pounds since her weight-loss journey began with last year’s Biggest Loser: Detroit Edition. The winner of this year’s competition will receive prizes, including a spot as the honorary Grand Marshall of America’s Thanksgiving Day Parade. Blue Cross Blue Shield of Michigan is teaming up with WDIV-TV and The Parade Company to announce participants in The Biggest Loser: Detroit Edition II. Biggest Loser: Detroit Edition II finalists will be revealed during the WDIV newscast on Monday, Aug. 30, beginning at 4 p.m. During the announcement, BCBSM President and CEO Daniel J. Loepp will be interviewed by Chuck Gaidica during the 5 p.m. newscast. This year, 310 people entered the contest. That’s 100 more applicants than last year. The applicants were narrowed down to 60 who were called back for audition interviews. From there, the final six were chosen. With the help of Blue Cross health coaches, the finalists will participate in the weight loss competition that will run into November. The winner of the competition will be announced during WDIV’s coverage of America’s Thanksgiving Parade, and all six contestants will ride on the BCBSM float. Last year’s winner, Marilyn Kluka of Farmington Hills, lost 47 pounds during the 11-week competition and was one of six contestants who lost a total of 270 pounds. As more than a million people eagerly awaited the launch of thousands of fireworks above the Detroit River on Monday, June 21, Blue Cross Blue Shield of Michigan, Local 4 and the Parade Company awaited a launch of a different kind. High atop the Miller Parking Garage at the Flip Floppin Summer VIP Rooftop Party, the stage was set for the triumphant return of the Biggest Loser: Detroit Edition. 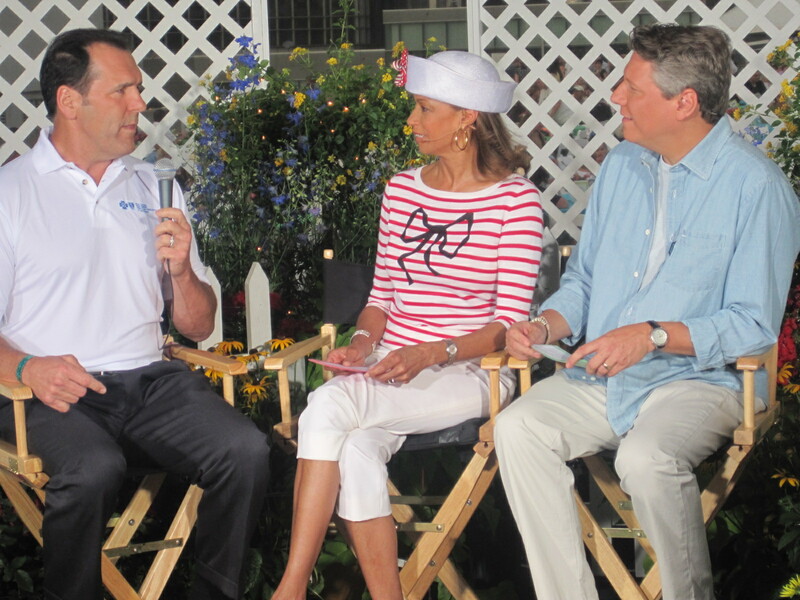 During WDIV’s live broadcast of the Target Fireworks, BCBSM Senior Vice President of Group Sales and Corporate Marketing, Ken Dallafior spoke with on-air anchors Carmen Harlan and Devin Scillian about Blue Cross’ commitment to leading Michigan to a healthier future. And, how that commitment is a driver in Blue Cross’ support of the Biggest Loser: Detroit Edition II.